1000 Word Picture: Picture #1 - Done! If a picture is worth a thousand words, what do those thousand words look like? I decided to ask people to look at a photograph and provide me with 100 words describing what they saw. Once I had a thousand words submitted I would edit the sentences together to make a complete composition, built by you, 100 words at a time. Once I have a collection of these I will be either publishing them or displaying them as an exhibit and/or auctioning them off for charity. 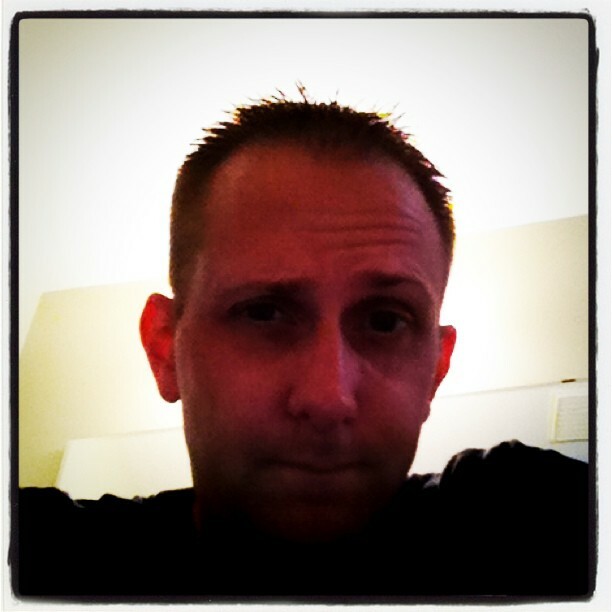 The site says I need a profile pic, and I guess it's better than the dopey little silhouette thing. What’d you think your webcam was for? I know if I don't put one up, she'll wonder why, and since she's the one who said I needed to get going with all this social-networking crap, I just better do it. "It'll make life easier," she said. "You know how hard it's been for you lately." Hmm - I see a dominating messianic spiky haired face. A quizzical figure with uneven ears, forehead all wrinkled from uneven years, this concussed blogger stares into the lens, framing himself, and willing to lend his visage to us for our inspiration seeking our creative vivification. I despised the man I saw in the mirror. The dark blue sweatshirt matches the bags under my eyes. It has dark fabric, the better to hide stains. I wonder about those stains. I've been wearing the same clothes; somehow I feel too vulnerable to take my clothes off, even just long enough to change. The incredible redness of your skin coupled with the shadow on the lower half of your face, remind me that drinking too much always leads to shades of hobo-ism. A messianic hobo. A messianic beatnik hobo - as I swear to God that is a black turtleneck gracing your body. Your translucent ears and the glow of your halo make me wonder if Christ has indeed come back, but then the dead stare and raised eyebrow make me think you are coming on to me - and I am no Mary Magdalene. Jesus. It wasn't because of any one thing I had done, but rather a litany of bad decisions that seemed to cascade in to a constant stream of horrible repercussions. The latest of which was me telling her "I love you". I care for her, sure. I like her. But love? Well, that was bad for both of us. My job didn't allow for 'love'. Hell, it barely allowed for bathroom breaks. “I’m going to make the world happy,” she replied without looking up. Then she rolled over and said, "Sorry about the knife, darling." “Do you think you could use a bit more purple?” She hesitated for a moment and shifted her perspective. Tongue slightly peeking out and her chin resting on her hands she considered it. She took the purple crayon that he handed to her. She couldn’t look up because there were more pressing matters. The matters of pressing the crayon to paper. The matters of staying on the paper. There were a hundred reasons why he should never have left that day, but she was the only one that mattered. He told himself he wouldn't look back, but he did. He filled her dog's water dish before he closed the door behind him for the last time. I answer the call of this Atlas unfettered. The man in the mirror looked different after that day: hit in the head. Foggy eyes hopeful for a bounty of words, just a dribble, a trickle, he might write toward. It was as if he was looking back through the years to the day he carried her across the threshold. That and the mirror was the hell of it: all for naught. The rabbit hole went much deeper. Black shirt, black eyes, black hair. Bugs and dirt. Black is one of those colours that invites you to imprint all your worst fears onto it. An involuntary snort, a slow bubbling up from an uneasy unconsciousness. Be well dearest Andrew, I hope you feel better. First he tasted nails... blood. Seconds later: the sun, painting its midday welt onto his skin; he couldn't tell where. Seconds later, an inventory. Existential first: I'm still here? “Yes.” I'm still here. Physical next, silently taking a roll call of arms and legs that were apparently scattered nearby. Lips pursed, breath held, shoulders half shrugging, an Atlas (not Charles), eyes foggy from drugging. Struggling ‘neath the weight of commercial wisdom, his cry is silent! Can we assist him? For a moment, he worked backwards, wondering how this came to pass. That was three days ago, I haven't slept much since. No, that would wait until later. Instead, it was time to make a decision about the eyes. What would they see when they were opened? All you know is that you don’t want to look at the Man In Black. No matter where you look, your eyes will not be obey you. They will always return to the Man In Black. White is just as merciless but somehow less accepting of other images. White on white is hard on the eyes. You don’t know where to look next. No, the Man In Black has chosen his colours well. There’s only one problem. That it wasn’t about privacy; it was that people didn’t understand. Hell, even “status updates” on their own bodies, but only for the early adopter types with the newest hardware. Online? Offline? It was just one of those moments in life where you wonder, is this my life? So we were there. Peering out at hundreds of people, every shift. Customers were driving me nuts at work, and then I got a text message from my girlfriend wanting to end things. That’s fine, no big deal as I wasn’t really attached to her anyway, but I had made the mistake of giving her my house key. When I got home there was a note saying she took Rover, a hound dog, with her because she claims he loves her more. It was really my roommate’s dog anyhow. So I opened the freezer, pulled out the whiskey bottle and drained back a few mouthfuls. It didn’t take long and I started feeling better. I took it with me to the living room, and dropped onto the sofa. The couch is comfortable enough, you know. Yep, this was my life. No girlfriend to nag me, and no dog howling at five AM. “We’re keeping people safe,” they’d been told in orientation. They didn’t take good care of themselves. They needed us. No such thing, my dears. The simple truth was that her getting close to me could end up with her killed. Probably by me. Of course, that was only the tip of the iceberg. All I can say is: 21st century technological age notwithstanding, there's got to be an easier way for zombies to find victims. Hard drive contents, social web activities. Christ, it got boring. No one ever sees it coming. “We’re keeping people safe,” they’d been told in orientation. That it wasn’t about privacy; it was that people didn’t understand. They didn’t take good care of themselves. They needed us. Peering out at hundreds of people, every shift. What’d you think your webcam was for? Christ, it got boring. Of course, that was only the tip of the iceberg. The rabbit hole went much deeper. Harddrive contents, social web activities. Hell, even “status updates” on their own bodies, but only for the early adopter types with the newest hardware. Online? Offline? No such thing, my dears. Hmmm - I see a dominating messianic spiky haired face. Your translucent ears and the glow of your halo make me wonder if Christ has indeed come back, but then the dead stare and raised eyebrow make me think you are coming on to me - and I am no Mary Magdalene. The incredible redness of your skin coupled with the shadow on the lower half of your face, remind me that drinking too much always leads to shades of hobo-ism. A messianic hobo. A messianic beatnik hobo - as I swear to God that is a black turtleneck gracing your body. The site says I need a profile pic, and I guess it's better than the dopey little silhouette thing. I know if I don't put one up, she'll wonder why, and since she's the one who said I needed to get going with all this social-networking crap, I just better do it. "It'll make life easier," she said. "You know how hard it's been for you lately." All I can say is: 21st century technological age notwithstanding,there's got to be an easier way for zombies to find victims. I despised the man I saw in the mirror. It wasn't because of any one thing I had done, but rather a litany of bad decisions that seemed to cascade in to a constant stream of horrible repercussions. The latest of which was me telling her "I love you". I care for her, sure. I like her. But love? Well, that was bad for both of us. My job didn't allow for 'love'. Hell, it barely allowed for bathroom breaks. The simple truth was that her getting close to me could end up with her killed. Probably by me. With an eyebrow cocked and a burning question behind his eyes he finally spit it out. “I’m going to make the world happy,” she replied without looking up. She couldn’t look up because there were more pressing matters. The matters of pressing the crayon to paper. The matters of staying on the paper. She hesitated for a moment and shifted her perspective. Tongue slightly peeking out and her chin resting on her hands she considered it. “Yes.” She took the purple crayon that he handed to her. Then she rolled over and said, "Sorry about the knife, darling." That was three days ago, I haven't slept much since. The couch is comfortable enough, you know. It has dark fabric, the better to hide stains. I wonder about those stains. Is there really something I should know? She hasn't said anything. I can hear her, in the kitchen. Chopping vegetables? Dear lord, I hope they're vegetables. I've been wearing the same clothes; somehow I feel too vulnerable to take my clothes off, even just long enough to change. The dark blue sweatshirt matches the bags under my eyes. an Atlas (not Charles), eyes foggy from drugging. His cry is silent! Can we assist him? just a dribble, a trickle, he might write toward. Be well dearest Andrew, I hope you feel better. would they see when they were opened? eyes will not be obey you. They will always return to the Man In Black. There were a hundred reasons why he should never have left that day, but she was the only one that mattered. The man in the mirror looked different after that day: hit in the head. He filled her dog's water dish before he closed the door behind him for the last time. He told himself he wouldn't look back, but he did. It was as if he was looking back through the years to the day he carried her across the threshold. No one ever sees it coming. That and the mirror was the hell of it: All for naught. It was just one of those moments in life where you wonder, is this my life. Customers were driving me nuts at work, and then I got a text message from my girlfriend wanting to end things. That’s fine, no big deal as I wasn’t really attached to her anyway, but I had made the mistake of giving her my house key. When I got home there was a note saying she took Rover, a hound dog, with her because she claims he loves her more. So I opened the freezer, pulled out the whiskey bottle and drained back a few mouthfuls. It didn’t take long and I started feeling better. I took it with me to the living room, and dropped onto the sofa. Yep, this was my life. No girlfriend to nag me, and no dog howling at five a.m. It was really my roommate’s dog anyhow.